Perhaps (Copley Gallery, Boston). (Robert C. Vose, Boston); sold 21 August 1930 to Thomas B. Clarke [1848-1931], New York, as a portrait of Robert Auchmuty by Joseph Badger; sold by Clarke's executors to (M. Knoedler & Co., New York), from whom it was purchased 29 January 1936, as part of the Clarke collection, by The A.W. Mellon Educational and Charitable Trust, Pittsburgh; gift to NGA, 1947. According to 1928 Clarke exhibition catalogue annotated with information from files of M. Knoedler & Co., NY (copy in NGA curatorial records and in NGA library). The provenance from Samuel Auchmuty, son of the supposed sitter, supplied to the Robert C. Vose by the dealer Rose M. de Forest, has been questioned by John Hill Morgan (undated note in NGA curatorial files) and cannot be verified. 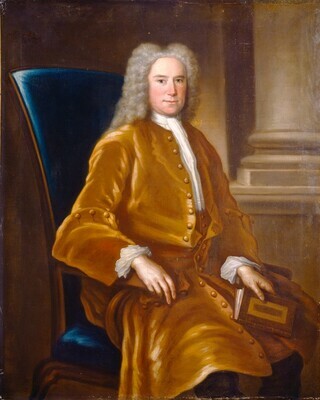 Colonial Portraits, Robert C. Vose Galleries, Boston, 1930, no. 6. The medium-weight canvas is finely plain woven; a strip of material has been added top and bottom: that at the top extremely irregular, varying from 5/8 to 1 1/8 in., that at the bottom approximately 1 in. deep; the canvas has been lined. The ground is white, smoothly applied, and of moderate thickness. There is a warm gray imprimatura. The painting is executed thinly and loosely, in opaque layers, blended wet into wet, with details of features added more crisply. The paint surface is abraded, especially in the darks, and there are numerous small losses; overpaint was removed in 1964, but the damages exposed were not compensated. The moderately thick natural resin varnish, which has discolored yellow slightly, appears to have been thinned, and to have been largely removed over the face and hands; a unifying layer of synthetic varnish was subsequently applied. Sellers, Charles Coleman. "Mezzotint Prototypes of Colonial Portraiture." The Art Quarterly 20 (1957): no. 14B, repro. American Paintings and Sculpture: An Illustrated Catalogue. National Gallery of Art, Washington, 1970: 158, repro., as Portrait of a Man by American (?). American Paintings: An Illustrated Catalogue. National Gallery of Art, Washington, 1980: 306, as Portrait of a Man by Unknown [Formerly Considered American]. European Paintings: An Illustrated Catalogue. National Gallery of Art, Washington, 1985: 408, repro., as Portrait of a Man by Unknown Nationality 18th Century. Hayes, John. British Paintings of the Sixteenth through Nineteenth Centuries. The Collections of the National Gallery of Art Systematic Catalogue. Washington, D.C., 1992: 312-313, repro. 313.